The Fuelpak FP3 will revolutionize fuel management for all new Harley-Davidson models now using the HDLAN system. Connecting wirelessly by Bluetooth to any iPhone or Android Smartphone, Fuelpak FP3 uses Flash technology to recalibrate engine parameters and mapping for exhaust systems and other performance upgrade downloaded from the expansive library of calibrations developed by Vance & Hines. Smartphone App User Interface (iOS and Android). Just bought a 2014 Street Glide Special. And as all good Harley owners know you have to do a stage 1 upgrade as soon as reasonably possible. This time I am using Cobra Powerport Header pipes, Cobra Tri-Oval slip-on mufflers and a Screamin Eagle air cleaner. I have done stage 1 upgrades on 4 different fuel injected bikes I have owned since 2003. 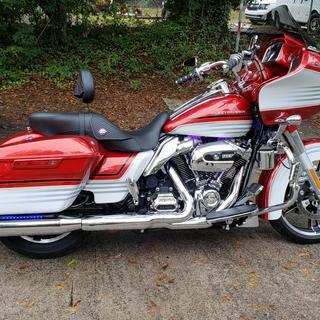 I used a Power Commander on an '03 Road Glide, original FuelPak on a '08 Nightster, MasterTune TTS on a '07 Street Glide and a Cobra FI2000 on a '13 Fat Boy Lo. To be honest the Power Commander and original FuelPak never impressed me much. Better than nothing but those bikes never ran as well as they should have. The TTS unit did a nice job and the bike ran well. But it was dialed in for a very specific Kuryakyn bike/air cleaner/exhaust setup. Not sure how you would use it on a more generic multiple component setup. Probably able to do it but not necessarily easy to figure out for a DIYer. The Cobra unit worked great and I would likely have bought one for my '14 Street Glide but they currently don't offer a unit for that bike. So I grabbed one of these new FP3's. It is less money than the Cobra. It is much quicker to install and once you have your bike dialed in you can remove it. I like the idea being able to take it off. Once you do you are back to having only factory equipment and connections on your bike. Unlike the Cobra system where you have an additional electronic component and 5 other non-factory electrical connections on your bike forever. The bike runs great. Good power, no flat spots or backfires. Just smooth power and a good fuel/air mixture. So in summary. The FP3 is relatively inexpensive. It takes less than 10 minutes to connect and download a custom map. Once the setup is correct you can remove the device and ride on happily ever after. Oh and be sure to get your stuff from Dennis Kirk. They are the best source for parts and accessories in the business. This thing is awesome! Way easier to put in than the last Fuelpak. Just download the App to your phone, pull the LH side cover off and plug it in. Fire the app up and turn your bike on and it instructs you from there. I first downloaded one of Vance & Hines maps and it worked well for my application (Cobra Tri-Flo and stock header pipe on 2014 CVO Limited). I then put the Cobra header on and decided to try the auto tune feature. The bike was not running well on the original map. Rode it for about 25 miles then installed the auto tune suggestions and instant improvement. This is one cool tech gadget you have to have for your new bike!! I used this on my 2014 FXDB and my 2015 FXDB, Used the V&H naked air and the V&H slip on straight shots HS. Worked outstanding, took about 15 mins. A must have if you are a V&H fan like me. its up to you how simple and how involved you want to make this. You could simply pick the map that's right for your bike and exhaust or you could get involved and change all kinds of things. Some think its too expensive but, I disagree. I added a new air cleaner and crusher slip-on's to my bike. Its a loud but, until I get pulled over its going to stay that way. now if I have to add a quiet baffle I can change my map and it wont cost me anything. Incredibly simple to install and setup! Also capable of adjusting your own settings, checking and resetting engine codes, adjusting throttle response and fuel settings. Love it! Just picked this up for my 2014 Street Bob. It had Big Shots without the fuelpak and it would backfire on decel and at times when pulling in the clutch. Put the fuelpak on, downloaded tune in about 10 minutes. Now the bike runs like a top! Absolutely no popping at all, bike runs much smoother and better. I think the Fuelpak is worth every penny! I highly recommend this product! Super easy. Look at your phone and pick a map. Love this tuner. Can't say enough. Love this fuelpak. Did the auto tune and it runs much better than it did after the dealer dyno tuned it . Much cheaper than Harleys tuner too. Works well, easy to use with smart phone. I wouldn't look ant further if you are upgrading your bike to the next stage. Pretty much a plug and go system! Had a problem with the screaming eagle fuel manager with backfiring, so plugged this one in, selected my pipes and air breather, no more backfiring!! If you're not chasing numbers and just want to make a few mods and have a good running bike this is the way to go. Simple and easy to use. Bike runs much better after installation. Very easy to hook up and use. Running a big sucker air cleaner and python exhaust and the FP3 eliminated the decel pop. I installed slip on exhaust, stage one air cleaner, vance and hines FP3 fuelpak. Followed down load instructions all worked well as long as you have a good signal, otherwise can take a little time, found my setting and applied and downloaded, took bike out for a ride noticed a considerable amount of difference. Works great! Very easy to use. Not my first time using a tuner but if it is for anyone buying very user friendly. I'm using it on a 2016 street glide special and I love the auto tune feature. This made all the difference. Easy to install and love the extra performance that it provides. I was very skeptical on using the FP3 as I'm not smart phone savvy. However, this only took me about 20 minutes to install, download map then take the Road King for a test ride. This is by far the easiest FuelPak I've ever installed. I've used the FP Legacy on my 07 Vrod and 05 Ultra Classic. I'd recommend this to anyone in search of a fuel tuner. Very impressed great quality, Worked right away i recommend this . Very easy set up. My pipe set up was not in map but talk to vance and hines for the best mapping for me. Installed it quick and easy. It does save original map too if you ever need to go back to it. Can easily be installed in 5 minutes on an 883 Iron. My bike is stock with restricter plates punched out of the mufflers. After flashing the ECU with FP3 "stock settings" my bike is more responsive, no longer has a ticking noise with rapid full throttle above 4000 rpms, and I noticed a heat reduction of more than 25 degrees (as indicated on iPhone app with pre and post map upload temp read out). I have never been a big fan of previous V&H FuelPaks, but I couldn't imagine a more comprehensive tool for the price. It's easy to use if you are inexperienced, but has almost any option you would want to mess with if you are experienced. Even if you don't plan on doing any modifications to your bike, I would still recommend this product so your HD can run the way it was supposed to. I was skeptical but now am a believer. Pumped the life into my '15 Road King. Easy to use, outstanding results. V&H got it right with the FP3. Does so much more than a Stage 1 download. Dennis Kirk consistently delivers great customer service with fast shipping, why I buy nowhere else. I really like the new FuelPak. I have the older version on 3 of my other bikes and will look into upgrading those, if available. This is very easy to tune and results in a reliable, very broad power band that is much better than the competition. Excellent tool to adjust ECM on my Harley. Well worth the cost. Essential to correctly fuel your bike once slip on's are added. I got new pipes, mufflers and air cleaner and the tuner. No need for an expensive dyno tune! Excellent performance! Can Tell a big difference in throttle response! auto tune feature is nice, bike is running great! All I did was pipes and air cleaner so I didn't want to pay for a one-time dyno tune at this time. Hooks up easily. Software is good. They actually had a map for my bike 2015 FLHXS with Pythons and Competition Baffles. The "Canned" map worked wonderfully! Like night and day. Ran smoother, started great, and much more power than the stock map. Then I autotuned it and it got just a bit better. The Bluetooth connecting procedure is a little weird. First the software can't find it. I try to connect and it won't. Then the software can find it? Who cares? It gets connected and works great. All is well. easy to use and I love the Bluetooth. not much room to mount under the seat on 2011 Harley Blackline, but it will fit. Easy to use and has great features many people don't know about. The Law Abiding Biker podcast has a great episode that goes in depth of it's capabilities and what Vance and Hines can do for your bike through it. They also have a great video on installation and operation. Installed along with the power duals headers, Raider 450 Slip-On Mufflers and the Naked VO2 intake. Easy to use app, and the Vance & Hines map for the bike is perfect. Playing with the autotune function and looking forward to seeing how that works. All together it's like a whole new bike. Highly recommend!! Takes about 5 minuites to install. So easy to set-up. I am using the "Autotune" to optimize my Bassani 2x2 head pipe. Amazing difference in the bike, truly brought it to life! Let me just say that this product is fantastic! I installed a set of Vance and Hines slip ons and a K&N air filter at the same time as installing the FP3. Installation and downloading the map was a breeze. It literally took me about 15 minutes to complete the entire installation of the map from my smart phone. There are some distinct advantages that you get from the FP3 to include: improved throttle response, reduced engine heat, and increased power. I've gone through 2 tanks of gas so far with no decel popping or any issues at all. Another useful feature included in the device is the ability to read and clear trouble codes. I browsed through this feature but haven't had the need to use it yet; however, it can help you find a problem before you spend a ton of money running a diagnostic at your local dealer. The FP3 was worth every dollar spent on it. Easy to use and makes changing the fuel map effortless. Can be used in a very basic manner. Or has the ability to be used to fine tune all areas of the program. Answer a few questions turn the ignition off and back on. Then you are ready to ride. I'm not a big tech guy. However I was able to use it with no issues. Money well spent to get my new CVO in tune with my new Vance and Hines exhuast. Does it fit 2017 CVO Ultra Limited? BEST ANSWER: I wouldn't recommend this specific tuner for a 107" engine as that engine didn't exist at the time my tuner was made. I suggest going to the Vance & Hines website to see if there's a tuner made for the 107 or contact them directly if you can't find the info on their website. I think they're a little behind on parts for the new engine since it only came out in September. I think that suggests that they're taking their time to ensure a quality product. I stand corrected. Just looked it up on the Vance & Hines website and this tuner will work for 2017 touring bikes! Sorry for jumping to conclusions on my previous answer. From what I've read it will. Had it on another bike loved it but have been told it will void the warranty on new models. Can it change the rev limiter ? Yes! I just found this feature based on your posted question. It took some time but it's there in the app. If you'd like to check it out before purchasing, I encourage you to download the FP3 app and play with it a little! It's pretty cool in my opinion! If you want a quick and easy preprogrammed tune, it doesn't get any quicker or easier in my opinion! It's also pretty much fully customizable! Yes, virtually anything is changeable about the performance of the motor, even camshafts, spark advance, Rev limiter... it's really a high quality tuner that even if you buy for a stock bike, with future intentions of building a hot rod, it'll will exceed expectations. I run it on a 2016 FLHXS with a pro pipe heavy breather, and I love it. Yes I did see the option to adjust rev limit. No I t won't change it. If I change something on my bike can I reprogram it as I do more mods to my? Or do I have to buy a new fuel Pax? 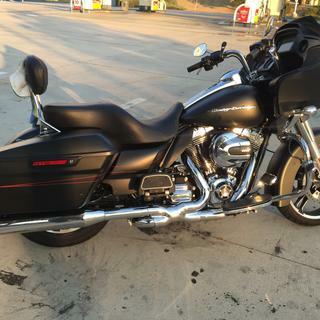 I've added a few more mods to my 2014 CVO Road King. I've changed the throttle response and rised the rev limiter setting with no problem. So I would say yes. I believe you would just retune your bike with a new map. Where is the bikes original map stored? BEST ANSWER: One you plug in FP3 module and download a new map. old map is stored in module. The module is then married to that bike only. The only way you can use module on another bike is to download original map to original bike (its encoded to bike vin #) and un-marry module. Can the fuel pack 3 be used with other manufacturer exhaust systems? BEST ANSWER: Yes it can. It will prompt you the option to pick an exhaust comparable to one of the vance&hines systems. I personally think it's better with a vance&hines system because it's tuning to the exact specifications for the exhaust. Yes it does work with any system. I have Rinehart 4" slip ons with Vance and Hines true duals. It works great. Many settings to choose from. I really like the the ability to change throttle response. This is a great product. Yes, call V&H tell them what you have, and they will tell you what to use as a starting point on the FP3, then you will do the auto tune from that point. Yes it can, there's a choice in there I believe it's the "Generic" or something like that, I've got some Rineharts on mine, and it works just fine. Can I use my android tablet or do I have to use a phone? The only way to know for sure is to check the app store on your tablet to seeing the FP3 app is available. I know you can use an Android phone but phone and tablet apps are different. I have apps on my phone that aren't available for my tablet. As long as your tablet has bluetooth you're good to go. You can as long as you have Bluetooth connectivity. Your tablet should be applicable. Can I use this on two bikes is my road king and my breakout or do I need two fp3 ? BEST ANSWER: You will need one for each bike. It only works with one engine ecu. Once it communicates with the ecu (engine control unit) it is forever locked to that ecu. I don't think swapping ecu's is a reasonable option or a very good idea. Unfortunately no... each tuner is married to one bike. I am sorry for a late response. I did not see til just now. No, you need two seperate fuelpaks. Once connected to one bike it's married To the one bike. You will need two one for each bike. No... Married to the bikes vin number. The fuelpak is married to one bike. BEST ANSWER: It's been a while since Ive played with mine but I'm pretty sure when the programmer syncs with your bike, it stores your factory map in the first open space (there are multiple spaces to save different maps for quick flashing). The original default is maintained...I don't recall the slot. There are locations for multiple maps. Will this leave a digital foot print in the ECU after removing the tune for when bike is traded in on a new bike? BEST ANSWER: I would just guess, if you return to the factory map, it would not show. But to be 100%, you should ask a Harley mechanic. ECM, not exam. Darned auto correct..
Will this work on a 2009 harley tri glide? BEST ANSWER: Not this one. However they have a model that will. I have used several of their programmers. They are great products. Yes, it’s for 2007 to 2016. Is there a benefit to adding the fuelpak to a bike if you are keeping the stock exhaust? BEST ANSWER: I don't think any benefit received by this module alone will outweigh the purchase price. In my opinion your money would have it's greatest impact if you purchase better exhaust AND headers (in order to eliminate the catalytic converter) and a high flow air filter system. This module will allow you to maximize the benefits of these upgrades. It greatly improved the benefit I got from my new exhaust & air filter systems. I agree with naplesninja, and if and when you get some new exhaust you’ll already have the FP3. Will the FP3 allow tuning on a 96 to a 106 hot set up kit? 106cid 585 cams and 58mm as throttle body. BEST ANSWER: You can custom tune with the FP3. It'll ask basic questions during setup such as 96 or 103 motor and whether you have factory or aftermarket exhaust but beyond that you can advance or retard your fuel settings among other things. For the most part, I believe you can make this tuner work for almost any setup. Just be sure to get the model intended for your bike and remember that once programmed, it'll only work for your bike. It knows the VIN # through the ECM on your bike. I hope this helps! I think the site for part number 66005 is not updated as the same part number on V&Hs website confirms this is compatible for my 2018 Harley-Davidson Road King Special - FLHRXS? Please don’t waste your moneyEnter an answer to this question. Why does the vance and hines web site state that this works for fxlds and your web site says it doesnt? BEST ANSWER: Are you looking at the right one? Maybe the site has not been updated. I know when the Lowrider S first came out, V&H didn't have a map available for it. I bought the fp3 for mine last year. I just had to keep in touch with V&H about when the maps were out. The FP3 has saved me a few times! Being able to use your phone to read and clear trouble codes is a great tool! When I changed my bars, I accidentally turned on the run switch before my TBW was hooked up and it put bike in "safe mode". If it wasn't for the FP3 I'd probably still be trying to start it! Haha! Plus if you have V&H exhaust it's probably best because it's maps are specifically designed for their systems. My FXDLS has the comp series 2 into 1 and the FP3 and it rips! I couldn't be happier with the way it runs. Does it include a speedometer correct feature? BEST ANSWER: And with the Fuelpak FP3 module plugged-in, Live Sensor Data can be viewed through the smartphone to display speed, RPM, cylinder head temperature, voltage, gear selection and other vital information. After map programed how long does your phone have to be linked to the bike? What model do I need for 2001 heritage softail? Will the Fuelpak void the factory warranty on a 2018 Harley Davidson Street Glide? Will the FP3 work with an I phone 6s?